The White House is a Grade II listed, historic property dating back to the 1730s situated in the East Sussex village of Burwash. Internally, the accommodation is spread over three floors and features include external window shutters, sash windows, panelled internal doors, high ceilings and deep skirting boards. Reception rooms include the dual aspect drawing room with an attractive fireplace and the adjoining dining room with doors out to the terrace. The sitting room also has a cosy fire and fitted bookshelves. The six large bedrooms, including the master suite, are arranged over the first and second floors. Bedroom five is currently used as a sewing room. Outside lie the mature gardens which are partly walled and mainly laid to lawn with a variety of trees, shrubs and pretty terraced areas. The garden continues to a former vegetable garden, a tennis court and swimming pool and a charming brick outbuilding is currently used as a home office/store room; the grounds come to an acre and a half. 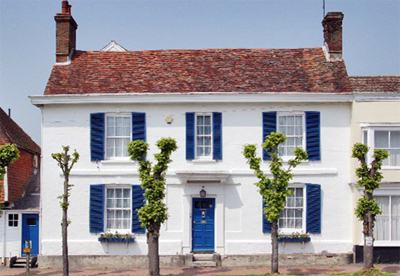 The White House is located in the heart of the popular East Sussex village of Burwash which has a number of excellent local shops while nearby Battle and Heathfield provide further local amenities. The guide price is £895,000. For further information please contact Savills on 01580 720 161 or visit their website.